CCSU Result : Get all Latest Exam Results Updates of CCSU. Get Latest Updates for CCSU Exam Result Information of Various Course of Graduation , Post Graduation . Choudhary Charan Singh University Offered Various Categories of Courses . Now, there are five faculties with 22 UGC sponsored and 35 selffinanced / Job oriented courses being run in the campus. 252 professional colleges/institutions 109 colleges and one constituent college are affiliated to Chaudhary Charan Singh University , Meerut. 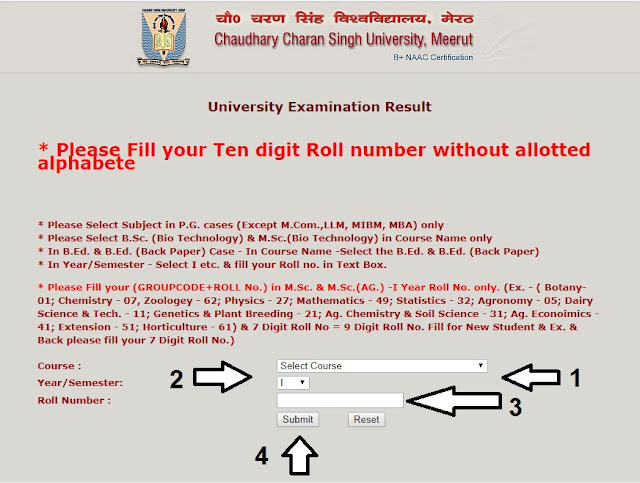 Here You Can Check All Latest for CCS University Meerut Results . 17-11-2018 : B.A. Private - First Year - Back Paper - 2018 - Check Now. 16-11-2018 : B.Ed. Second Year - 2018 - Check Now. 15-11-2018 : B.A. Private - Second Year - 2018 - Check Now. 14-11-2018 : B.Com. Private - 1st & 2nd Year Back Paper - 2018 - Check Now. 13-11-2018 : M.A. , M.Com. Private 1st Year All Sub. Back Paper 2018 - Check Now. 12-11-2018 : M.A. 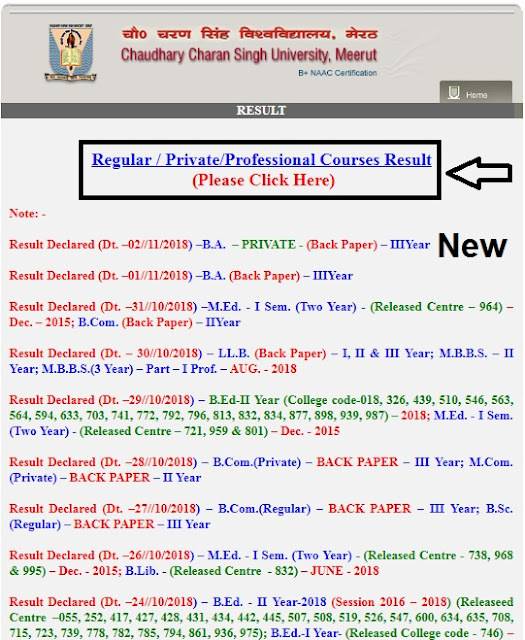 (PRIVATE)-II Year (All Subjects) – BACK PAPER – 2018-Check Now. 12-11-2018 : BABED-I, II & III Year - Check Now. 12-11-2018 : BFA-I & II Year, B.EL.Ed.-I, II, III & IV Year, B.LIb.-I Year - Check Now. 12-11-2018 : BMLT-I, II & III Year, BMM-II Year, BMRDIT-I & II Year, BOT-I, II, & III Year, BPE-III Year, BPT-I, II, III & IV Year - Check Now. 12-11-2018 : B.Sc.Microbiology-I, II & III Year - Check Now. 12-11-2018 : B.Sc. Nursing-I, II, III & IV Year -Check Now. 12-11-2018 : B.Sc.Biotechnology-I, II & III Year- Check Now. 12-11-2018 : MPT-I & II Year - Check Now. 12-11-2018 : M.Sc. Nursing-I & II Year - Check Now. 12-11-2018 : Post Basic Nursing-I & II Year – SPECIAL EXAM. - 2018 - Check Now.